Air Brick Covers are designed to prevent water from entering a building via "Air Bricks" (bricks designed to allow air to circulate in the cavity of the wall or to allow fresh air into a building or vents). 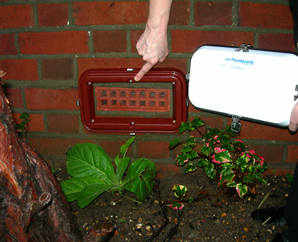 Floodguards Airbrick covers are all BSI Kitemarked and specifically designed and manufactured for purpose. 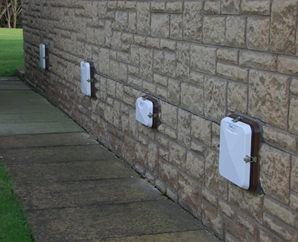 All covers are white – to remind property owners to remove them after the danger of flooding has past, it is essential that the covers are removed; leaving the covers on can lead to damp in cavities which could result in a moisture build up. The covers are clipped to custom-fitted back frames that have been sealed to the wall. Like Floodguards, the greater the water pressure, the tighter the seal. After use, simply wash the covers and put them away. Back frames can be ordered in grey, brown, brick red and white but we can produce almost any custom colour to ensure that your frames blend in to the walls of the property being protected. We can also make custom back frames and covers to deal with any unusually-shaped airbricks or vents.